Blog Feed Am I in God's will? 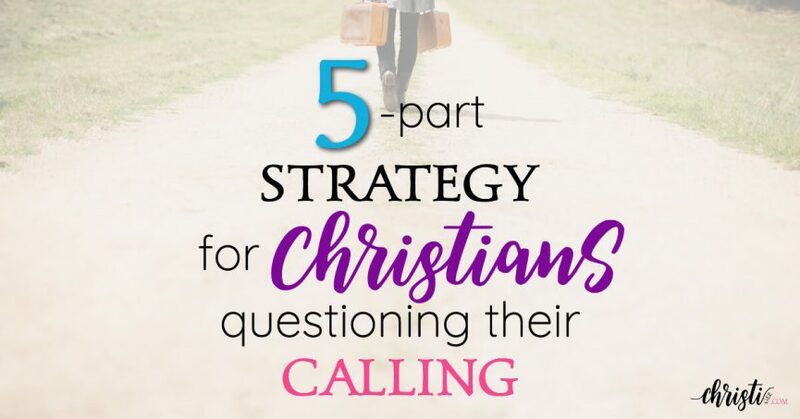 Stand up to the enemy's questions that haunt you! The enemy uses our passion for being in God’s will against us. 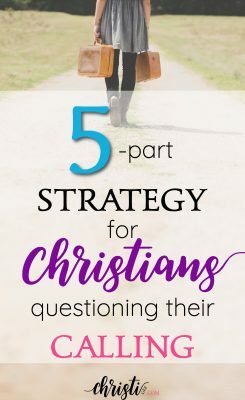 Here’s a 5-part strategy for standing up to the questions that undermine your confidence and threaten your calling. “I’m beginning to think this was all a mistake. We weren’t really in God’s will after all,” I told my husband. He stood firm, recounting how God had spoken through His Word and through other believers. Every detail had lined up and everywhere we turned we had seen His answer to prayer. We were where we were supposed to be. This was not a mistake. As I listened to my husband, I was transported back two years. He was right. Back then it was exhilarating. We had a renewed sense of purpose and couldn’t wait to discover more of the “why” behind what God was clearly orchestrating. Are we in God’s will? Conversations like this popped up now and then, but each time we encouraged one another by retelling the story of how we got to that point. It was all God. And if God had led us to it, He would lead us through it. And then came the knock at my door. Well, more like the door of my heart. At first, my answer was, “Of course he did. It was clear as day.” And I shooed him off my sidewalk. I entertained the question a little longer since my recollection was a bit dimmer than before. “I think he did.” And I invited him to sit in the rocker on my porch and talk about it. He returned later that winter. Light was in short supply during that season, but I could see his shadowy figure approaching the threshold. It was now dark outside and dark in my heart. As I stood there struggling to remember why he was wrong, he slithered in behind me. And just like that, the crafty little beast now had full access to my home. It took a while for me to realize he was there. Where his questions ended and my own began is fuzzy. It doesn’t really matter who asked what, I guess. The outcome was doubt. Doubt produced discouragement. And once discouragement had taken root, there was a full harvest of rotten fruit in my life. And more questions. They seemed to breed faster than two bunnies as my youngest likes to say. From there, the days became wearisome and my sense of purpose and passion faded. I preached the truth to myself, but the artery that carried truth from my head to my heart had become clogged. I questioned in the dark what God told us in the light. Eventually, the Holy Spirit went on a spring-cleaning rampage. Once the film was removed from the windows of my heart, I could see clearly. And I couldn’t believe how easily I had questioned if we were in God’s will. The snake was no match for the Spirit’s fluffy duster and he wasn’t a fan of the light, so he slithered out the back door. “What do you think you’re doing? God didn’t call you to this. You made it all up. This is way more than you are equipped to handle. But this time, I was more prepared. Have I mentioned that my husband bought me a .380? Lock-and-load baby. You see, I’ve had this post brewing on the back burner for over year. Well, maybe they don’t. But what if they do? What if revealing the enemy’s favorite tactics in my life helps someone else fight stronger, resist harder, and hold on? Maybe that’s you, fellow soldier. If so, join me around the table and let’s talk strategy for a moment. Bring your shield. I’ve learned the enemy uses our passion for being in God’s will against us. One of the things Christians value most is mission. We want (NEED) to know our obedience matters to the kingdom. We want to be good soldiers. But since part of the deal is that we walk by faith, not by sight, we don’t get flashing arrows in the sky saying, “You are here. And this is right.” Thus, when the battle rages, we’re tempted to wonder if we wandered into a war that wasn’t necessary. And so the first step is to recognize this vulnerability. And realize the enemy knows about it as well. If he can cause us to doubt our calling, he can undermine our conviction to persevere and neutralize our efforts. He has perfected the art of making the believer question his purpose. After all. He can’t steal our salvation, so the consolation prizes are our passion, our peace, and our joy at serving in the kingdom. Some things never change. Check it out. Genesis 3. The enemy slithers up and “simply” asks a question, “Did God really say …?” You know the rest of the story. Eve took the bait and took a bite. It’s a tale as old as time. Literally. (And I don’t mean the proverbial “literally.”) Satan’s line of questioning caused Eve to doubt God’s authority. “But I don’t question God’s authority,” you say. Yep. That’s what I said. I’m a Bible teacher after all. I believe in the all-sufficient, completely accurate, inspired WORD. God gets the final say on everything. Even if when I’m doing it wrong, I don’t question that it’s wrong. Because God said so. There’s this thing called “good.” And somehow, I seem to believe that I’m a better judge of it than God. But God is not just the author of good, He is the AUTHORITY on good. When things aren’t good according to my definition and I begin to doubt if God called me to it in the first place, then I am effectively questioning his authority to declare what is good. It’s a sneaky sneak attack. Questions can get in the back door of our minds where frontal assaults would meet resistance. This is because most questions ARE good. They bring clarity. And even if they don’t end in answers, we grow and develop by simply considering them. Some questions are not worth my time or yours. So I’m learning to test the question before I even contemplate the answer. If you are questioning right now, I invite you to question the question. Why has it come up? Will answering it lead to clarity or confusion? Is it just a strength sucker and dark rabbit hole? Remember: God is not a God of confusion (1 Cor. 14:33). That may help you determine the source. The word “adversary” is the Greek word for a legal opponent and “devil” means “slanderer.” Think about that combination. And if they are unscrupulous, they lead the witness, reframe the facts, and flat out confuse those trying to get to the truth. And what does a slanderer do? Tarnish your reputation and cause others to doubt your worth. The enemy has his own kangaroo court. Here he questions our motives and argues against our qualifications. He brings up past sins as evidence for why we have no business attempting to represent God or tell His story. “Who do you think you are?” he shouts from across the courtroom. Recognize the charges. Have you been trying to defend yourself against accusations like this? Don’t approach the bench for permission to step down. Just run. Out the back door. You don’t belong in the enemy’s court. It’s nothing but a distraction. Just because you’re drawing fire doesn’t mean you’re NOT in God’s will. In fact, it may be validation that you are defending a strategic location. Think about all the “s’s” in Ephesians 6:11-12. The enemy’s plural is no match for God’s singular. One God. Greater. Greater is HE that is in you. (1 John 4:4) And don’t you think He is big enough to lead you where He wants you? Did you get marching orders? Did you pray, seek godly counsel, and base the decision on Scriptural truth? And now things seem to be going nowhere. Or worse, falling apart. Or maybe you’re just exhausted and feeling overwhelmed? And you’re wondering if you were called to this after all? Don’t retreat yet. Hang on a little while longer. Pray. Confess to a trusted friend or advisor your doubts. Search Scripture. Ask God for wisdom. keep doing the last thing He told you. Even though it doesn’t seem good. Even though the adversary accuses. Even though the battle rages. And remember you have an arsenal full of the most powerful weapons. Put them to use while you test the questions and survey the battle. If you get a knock on the door and open to find the creature hissing at you from the shadows … Lock-and-Load, baby. Looking for more about being in God’s will? This is the best article I’ve ever read on this topic and it spoke to me at exactly the right moment with many confirmations to support it in all directions. I have been debating with God over how to discern His will and how to hear his voice and I’ve even been randomly placed in a bible study (only a few days ago) regarding the same topic (over questions! Using the same verse from Genesis 3!) and it all aligns exactly with what I’ve been struggling to discern. Yet now I see with much more clarity, keep up the good work!!! Oh, my … because of your comment I returned to this post written many years ago. I needed this reminder myself for so many reasons. I’m humbled it was so used in your life. Thank you for blessing me with your comment. Thank you for writing this post and sharing your experience! I am definitely at war with the enemy ,and have been dealing with the doubts and lies. I agree with the other comments that your particular voice and experiences reach people. We can read the same scriptures over and over and each time see something new we didn’t see before! Even if many have touched on this topic, we can learn or think about things in a different way! Your blog post is continuing to reach people and encourage others in the faith! Amazing post! Just what I needed at this particular time.Thank you for being God’s instrument to bring an encouraging word to my heart! Thank you for posting this. Thank you sooo much! I’m in tears, as I was reading this article. I’m so sorry you identified to the point of tears, but thankful it ministered. Appreciate you taking the time to let me know! THANK YOU for writing this! It was just what my heart needed! I found this on Pinterest after having a serious discussion with the enemy about how my life and my family are not his to toy with.. My husband lost his job last year, and we have been drowning. A few months ago, he got a new job, which required us to move a few hours away from our family and friends. It has been extremely difficult. Not only is he hating the job, but it seems as though the bills are piling up even more than before.. I know God orchestrated this move, and I had such a peace about the entire situation, but the past few weeks have caused serious doubt and discouragement.. I don’t know why He moved us here, but I KNOW He did, and that’s all that matters. 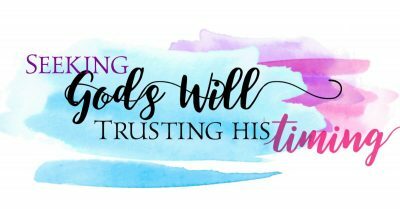 God has been teaching me so much this past week about faith and trust, and this blog post has confirmed everything He has been showing me. I love how you said that God’s singular is greater than the enemy’s plural! I couldn’t stop the tears! This has been so trying, and you have played a small part in what God has been trying to show me, so thank you again! What a journey you are on, sister. I recognize so much of what you describe in battling doubt and discouragement. The battle to let what we KNOW trump what we FEEL is vicious. I had forgotten I wrote so much of this and your comment caused me to revisit these words. Thank you for that. I needed them again as well. Did you know that God uses Pinterest? Well that’s how He brought me here, to the message my heart so needed to hear, one that helps to drown out the noise of the insistent knocking. As I prepare to take on a new job, with a lofty title and more responsibilities than I’ve ever managed, I’m finding myself entangled in doubt’s trap more than I imagined and much more than I’d like. I so appreciate your goals and the examples you provide for each, that show that they are able to be achieved. Thank you for these words & for kicking the hiss to the curb! Wow. Thank you for letting me know. I know the doubt well. Hang in there through the transition in your new job. If it’s worth doing, you can expect resistance! I’m a little speechless at your comment. I’m so aware lately of the need to be obedient in the moment and that’s what this post was ~ obedience. Hearing you affirm its value in your journey is deeply encouraging to me. Thank you so much for taking the time to write. I pray you are inspired to keep stepping into what God has laid out for you and that for the moment. We need each other to remind one another of the truth because it seems the enemy continues to hiss louder and louder.